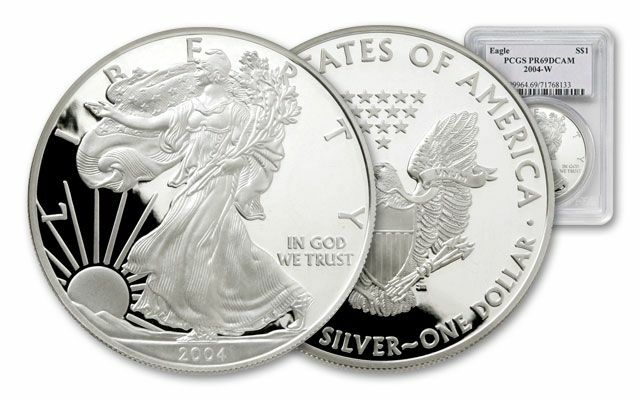 America’s finest silver is displayed in all its glory with the 2004 American Eagle Silver Dollar. Every year savvy buyers stash these away. Each is struck in one ounce of 99.9% fine silver and graded in almost flawless Proof-69 condition. Grading service varies. Also issued that year were 850,000 2004 Proof Silver Eagles. This beautiful collectible coin is struck with a cameo finish, achieved by hand-loading a highly burnished blank into the coining press and striking it multiple times. 2004 Silver Eagle proofs have a softly frosted texture on the raised portions of the design—such a stark contrast to the highly polished background field that it appears almost to float above the surface. 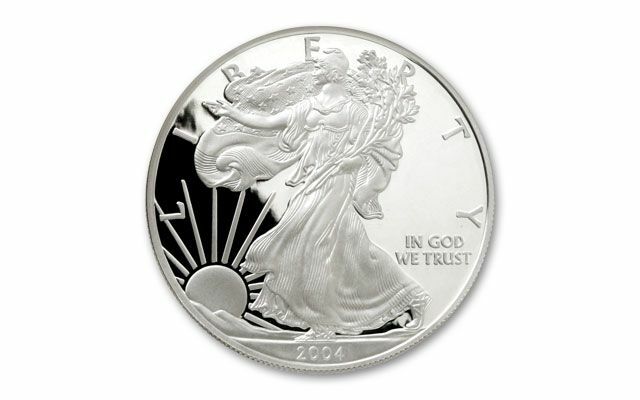 The 2004 Silver Eagle coin features the series' "Walking Liberty" design, an inspiring image based on a similar depiction which appeared on the "Walking Liberty" half dollar from 1917 to 1947. The Silver Eagle's reverse face shows a bald eagle in a heraldic pose. Its talons clutch a sheaf of arrows and an olive branch, symbolizing a desire for peace but a readiness for war. 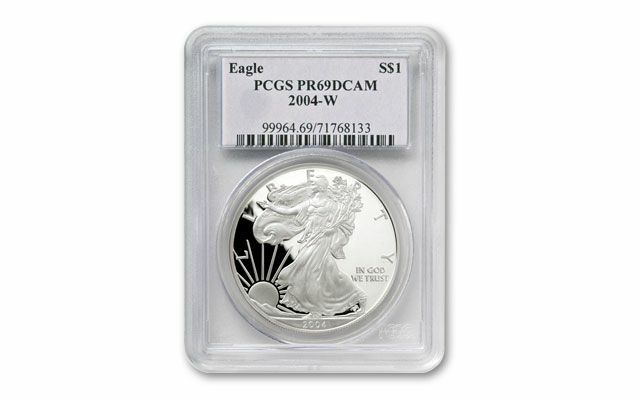 The 2004 Silver Eagle is a popular choice among serious collectors. Unlike most bullion coins, American Silver Eagles are non-reportable, assuring privacy, safety and security. In fact, American Silver Eagle bullion coins are one of the most secure, liquid, convenient and beautiful way to own pure silver. They're also the ONLY silver bullion coins whose content, weight and purity are guaranteed by the U.S. Government. The overall average price of silver during 2004 was $6.67 per ounce.